The right exposure with the right benchmark? The real money these days is to be made in constructing and licensing indices, a market cornered by MSCI, Dow Jones or FTSE. An index is a theoretical construct, made out of securities, where the price of a security is usually weighed by a factor, generally the outstanding number of securities – the so called market weighted index. The idea behind this type of index was that is the best proxy for systematic risk, and exposure to risk is needed to have a fair shot at expected return. Billions of assets are managed with these indices. There is even a whole line of research, analyzing what to do if the index provider changes the composition. The index itself is now under scrutiny. Come to think of it, maybe even under attack. With a market-weighted index, and investor reshuffles his portfolio, buying a disproportional amount of yesterday’s winners – the securities whose prices have risen most in the past, increase their share in the index, and if you believe in mean reversion on a stock level, you also buy tomorrow’s losers. Not an appealing prospect. What’s the alternative then? The natural approach is to tinker with the weightings. One approach is to discard them altogether, creating equally weighted indices. Another approach is to base the weightings on other information, such as balance sheet and P&L information of a company. This forms the “fundamental index” school by Robert Arnott et al. While the line of reasoning is sympathetic, it needs from academic rigor whether this is a worthwhile alternative. For example, it has not been able to shake off criticism that this approach simply creates indices with a value bias, a specific investment style, hence nothing new. 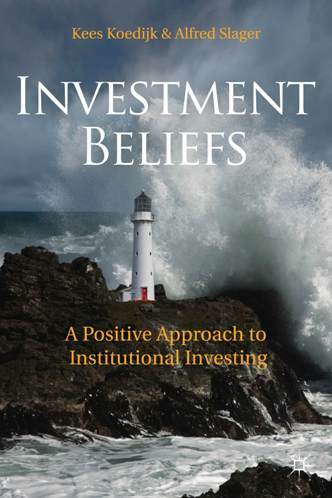 Another approach, stemming from academic research, faces the challenge head-on and introduces the minimum volatility or low volatility portfolio. The finance textbook teaches us that for a group of asset classes or securities, an efficient frontier can be created, the combination of portfolios that offer the highest return given the risk. The finance textbook also learns that there is an optimal trade-off between return and risk, the mean variance optimization. Ditch benchmarks, and develop such portfolios. In the Netherlands, Pim van Vliet and David Blitz from asset manager Robeco have done interesting research on this . So research is sorely needed to analyze the different developments in benchmark, how to implement and combine them in portfolios. Liability Driven Investments: the ultimate model? What is the model to manage your fund with? The perception in conferences seems that ALM is on its way out and LDI the new star on the horizon. Is there merely a technical debate? Any pension fund or insurer invests to cover at least the estimated costs of the future pension liabilities. Asset liability management (ALM) is an overall risk management technique for pension funds, to help the board of a pension fund formulate a sound strategy. Its result is usually an investment policy for the whole balance sheet. ALM is based on stochastic simulation and is used as a basis for decisions on the distribution of future contributions, funding, and indexing levels. ALM does not predict the future, but it gives insight into the possible risks a pension fund is exposed to and how to handle them. The combination of stochastic simulation, and the fact the ALM does not predict the future, worries decision makers. 2008 and 2009 were rough years for ALM consultants. Critics pointed out that the models had a tendency to show the bright side of the financial markets, working with far too optimistic assumptions. Also, the focus of ALM was on discussing the simulation outcomes that were acceptable. The worst outcomes were seen as an act of God, and within decision making more or less neglected. 2008 showed that pain of this neglect, when cover ratio’s of pension funds fell dramatically, simply because there was no back up plan or fire drill manual in place. It is a bit harsh to criticize the ALM consultants for this failure. Critics also point out, more fundamentally, that it does not make sense to set an investment policy with market-based benchmarks, while the liabilities form the true benchmark. Enter LDI – Liability Driven Investments. The first step is to dissect the balance sheet according to the characteristics of the liabilities. If pensioners’ rights are cast in iron, then part of the investment portfolio is transformed into a (fixed income) portfolio that matches the movements of the liabilities. This part is then labeled “hedge” portfolio or “matching”. The remainder of the portfolio then becomes a “return” portfolio, with the goal of earning absolute returns to compensate pensioners for inflation. Unsurprisingly, investment managers champion this idea. After all, achieving returns in the investment portfolio should be unrestricted as possible. But the LDI creates a whole set of new questions. Governance for example. How should you determine the allocation between matching and return portfolio? Is this a rule-based decision? It makes sense that if returns bode well, you increase the allocation to the matching portfolio, becoming more of an insurer. But will a board be inclined to do this? High returns generally invoke hubris. Boards believe that they have become market savvy and will be reluctant to reduce their risk appetite. And what to do if it is the other way around? Another question is: what exactly do you match? The nominal liabilities? Liabilities corrected for inflation? What about longevity? A more fundamental criticism of LDI is that it while it seems transparent and sensible to create compartments for your pension liabilities (the younger, the elder ones, more or less guarantee), it also might be slippery slope. True strength of pension funds lie in intergenerational solidarity – pooling investment returns over time, helping stabilize return and risk over time, and pooling participants, lowering costs. ALM might have focused too much on solidarity; the danger is the LDI does the opposite. What the sector needs is research that objectively compares these models and its offspring. A call to research arms! Performance compensation. Why can’t we have fee schedules that are truly aligned? Is it true that pension funds simply cannot make a fist to change compensation, or haven’t they tried? Optimal scale: are there limits to the optimal scale of a pension fund, or do we progress towards one national pension fund per country? Who is stakeholder in the scale discussion? Regulation: Active versus passive management: are we anywhere near a consensus in this debate that actually helps pension boards? This entry was posted in Blog, Finance and tagged ALM, Benchmark, investment debates, LDI. Bookmark the permalink.